Hair becomes frizzy when the hair cuticle is raised, allowing moisture to escape and enlarging the strands. It also becomes frizzy when the strands do not bend in the same direction, giving an appearance of untidiness. This problem is more pronounced in curly hair than in straight hair. The reason is curly hair tends to be drier than straight hair. The curl pattern of curly hair prevents the natural oils secreted by the scalp from reaching the ends of the hair. This leaves the hair parched, causing it to frizz. Being exposed to humidity – In summer, keeping curly hair frizz-free is a challenge because humidity levels are higher. Humidity breaks up the internal hydrogen bonds in curly hair, causing it to shrink, frizz, and lose definition. 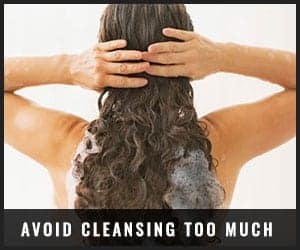 Cleansing the hair more than necessary – Washing curly hair with cleanser too often can compromise its natural barrier which helps to retain moisture and defend it against the elements. In the absence of this protective barrier, curly hair tends to become dry, brittle, and frizzy. 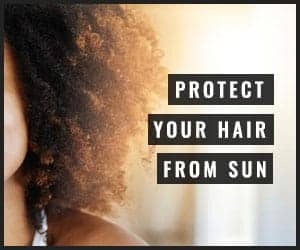 Heat, sun, and friction-induced damage – The heat from heat styling appliances, the UV rays from the sun, and the friction from hair brushing all cause curly hair to become weaker and more susceptible to frizz and breakage. Doing so damages the hair cuticle and pulls on the strands, eventually breaking them. Instead, comb your hair with a wide-toothed comb or your fingers. For better results, rub any natural oil such as argan, jojoba, olive, or coconut oil on your fingers or the teeth of your comb sparingly. With the help of a wide-toothed comb, comb your frizz-prone curls in sections immediately after you have towel-dried your hair. This step goes a long way in reducing tangles and frizz in curly hair. Use a half nylon/half boar bristle brush for this purpose and apply coconut or argan oil for extra hydration. This step will help to minimize the post-shower frizz by distributing the product more evenly and spreading the natural oils to the ends of your hair. Curly hair frizzes out of control when it comes in contact with shampoo which is harsh on this hair type especially if it contains sulfates. This ingredient dehydrates the hair by stripping its natural oils. Therefore, you should avoid it at all costs. Opt for a mild cleanser, baby shampoo, or cleansing conditioner instead. These products will cleanse your hair without drying it out. Cleanse your hair no more than twice a week – once a week for extremely dry curls – and simply rinse your hair or co-wash on other days. Hot water lifts the naturally raised cuticle of curly hair more. This widens the gap between overlapping cells further, enabling moisture and essential nutrients to escape and humidity to enter. 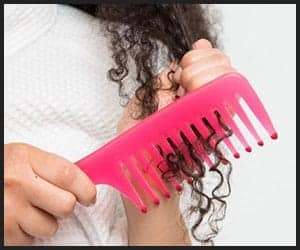 It is advisable to rinse curly hair with cold or lukewarm water and to keep your shower as short as possible to counteract the problem of an open cuticle. Products of this category tend to be harsh on curly hair, dehydrating it further and causing split ends and frizz. Always look for cleansers with natural oils such as avocado, coconut, or argan oil for a hydrating wash. The fibers in a regular or terrycloth towel rub against the strands of curly hair, create tremendous friction, and disturb the cuticle. The damage thus caused leads to frizz. Therefore, a microfiber towel is preferable. It will absorb excess moisture from your wet hair without disturbing the cuticle thereby controlling frizz. This can be done in a number of ways: a) pre-shampoo treatment, b) hot oil treatment, c) hair mask, d) deep conditioning, e) leave-in conditioner, f) detangling product, and g) anti-frizz product. A pre-wash treatment is pretty much as its name suggests. 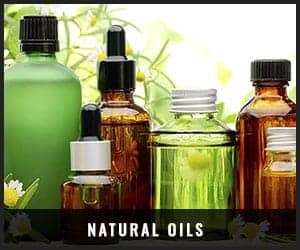 Any natural oil, hair conditioner or hair butter can be applied to the mid-lengths and ends of curly hair overnight, a day before wash day, or an hour before you shower. Wash off the product with your cleanser. For a hot oil treatment to be effective, coconut, olive, avocado, or argan oil should be warmed and applied to frizz-prone curls. Wear a shower cap and keep it on for at least 30 minutes, and at most 2 hours, before washing your hair. Apply any hair butter such as shea, cocoa, or mango butter to your strands as directed in the product label. This will hydrate curly hair and keep frizz at bay. Use a deep conditioner at least twice a month to replenish rapidly depleting moisture in curly hair. A leave-in conditioner will do the job just as well, but must be left in curly hair for as long as an hour for better results. To detangle stubborn hair, moisturizing it with a leave-in conditioner overnight helps immensely. The downside of curly hair is negotiating difficult knots because this hair type is so dry and frizzy. A detangling product can resolve this issue by softening the strands. A reliable frizz cream is your companion on the go because this product makes your curly mane more manageable with its frizz-fighting properties. This cannot be emphasized enough. So many young women ruin their hair due to poor heat-styling choices. 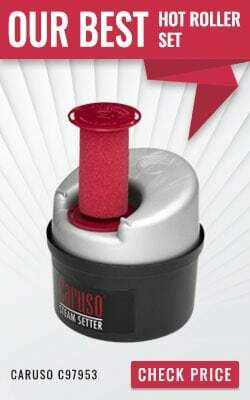 Although air-drying is desirable, it is not always a feasible option especially when you are pressed for time. The blow dryer and other heat styling tools are an integral part of every modern woman’s hair care kit. However, it is crucial to choose those tools which are designed to provide heat protection without limiting hair styling possibilities. One way to do this is to invest in an ionic ceramic blow dryer. Make sure you use it on a low heat setting and with a diffuser attachment to distribute the heat more uniformly and at a consistent temperature. Another smart investment is hot rollers. To control frizzy hair, choose the heated rollers with ionic technology, argan oil infusion, and multiple roller sizes. 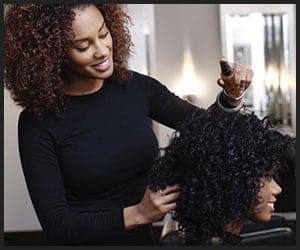 A hairstylist with expertise and experience in tackling curly hair issues, particularly frizz, is your best weapon in the battle against frizz. He/she will know which hairstyle will give you the look you desire and reduce frizz at the same time. He/she will also advise you on trimming schedules to keep split ends, tangles, and frizz under control. He/she can also give you an Olaplex treatment at regular intervals so you do not have to struggle with frizz all the time. Needless to say, using products that are formulated for curly hair play a vital role in combating frizz and resolving other curly hair issues. A wide range of cleansers and heat protectants sold in supermarkets and drugstores contain chemicals which are harmful to curly hair because they cause an incredible amount of frizz and knots. Read product labels very carefully and avoid products that contain silicones, sulfates, parabens, and alcohol as much as possible. Gels, mousses, and hairsprays often have alcohol in them which dries out curly hair to the point of turning it into a bird’s nest. Switch to alcohol-free alternatives such as aloe vera gel. Replace supermarket brands with salon-quality products even if they cost a little more because they are free from all the harsh chemicals that can cause frizz. Curly hair needs protection from the sun and heat styling tools otherwise, it will frizz uncontrollably. Therefore, use products with built-in sunscreen and heat protection each time you go out in the sun or style your hair with heat. Satin is your best friend for life if you aspire for frizz-free curls. Sleep on satin pillowcases or wrap your head in a satin scarf at bedtime, tie your hair with satin scrunchies, and cover your hair with a satin scarf when you go out. Satin is smoother than silk and will not create unwanted friction in your strands. In this way, you can bid frizz goodbye. Chronic dandruff and other scalp issues can contribute to the problem of frizz. Scalp issues often stem from product residues and hard water deposits on the scalp. A suitable anti-dandruff shampoo (seek the advice of a trichologist if in doubt) and a clarifying treatment will help to reverse damage of this kind and reduce frizz. For curly hair with high porosity, a clarifying treatment once a month will suffice. Curly hair with low porosity, on the other hand, will require 2 clarifying treatments each month. A rinse of apple cider vinegar is better than a commercially available clarifying shampoo which can contain harmful chemicals. 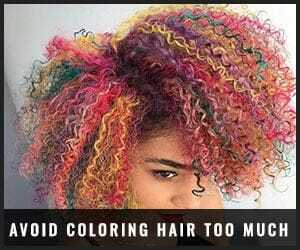 Exposing curly hair to dyes, bleach, and color too often can damage the cuticle and make your curls brittle and frizzy. Limit your use of these chemical treatments. Be content with the natural color of your hair. If you wish to try out a different color, opt for natural alternatives such as an organic henna paste. Poor nutrition can trigger hair problems like breakage and frizz. Therefore, it is essential to eat the right foods in the right amounts. It is equally important to stay hydrated by drinking at least 6 glasses of water throughout the day. 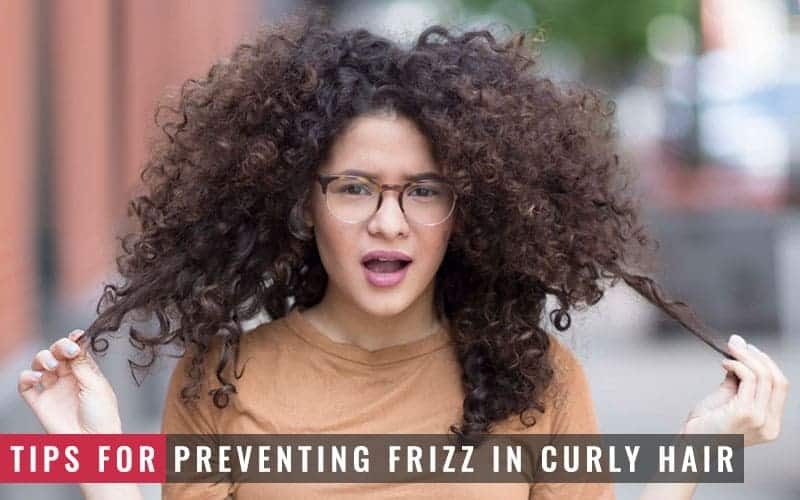 Dryness in curly hair is the principal reason behind frizz. 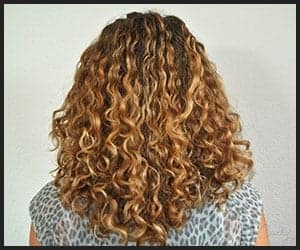 Taking steps (like those listed above) to keep your curls hydrated before going to work, on the commute, before and after taking a shower, at bedtime, and on your travels is key to controlling frizz. Remember your fluids and nutrition too because an imbalanced diet affects the hair first.